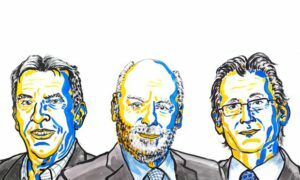 The Nobel Prize in Chemistry for 2016 has been awarded to Jean-Pierre Sauvage, Sir J. Fraser Stoddart and Bernard L. Feringa for developing molecular machines, the world’s smallest machines that may one day act as artificial muscles to power tiny robots or even prosthetic limbs. Inspired by proteins that naturally act as biological machines within cells, these synthetic copies are usually constructed of a few molecules fused together.Also called nanomachines or nanobots, they can be put to work as tiny motors, ratchets, pistons or wheels to produce mechanical motion in response to stimuli such as light or temperature change. Jean-Pierre Sauvage of France, J. Fraser Stoddart of Britain and Bernard Feringa of the Netherlands “developed molecules with controllable movements, which can perform a task when energy is added”. The three laureates will share the eight million Swedish kronor (around $933,000) prize equally. Also called nanobots, these tiny machines can be put to work as motors, ratchets, pistons or wheels. The development of computing demonstrates how the miniaturisation of technology can lead to a revolution. The Academy says molecular machines “will most likely be used in the development of things such as new materials, sensors and energy storage systems”. The chemistry prize is the last of this year’s science awards. The medicine prize went to a Japanese biologist who discovered the process by which a cell breaks down and recycles content. The physics prize was shared by three British-born scientists for theoretical discoveries that shed light on strange states of matter. The Nobel Prizes will be handed out at ceremonies in Stockholm and Oslo on December 10, the anniversary of prize founder Alfred Nobel’s death in 1896.